I am not really a beauty blogger but I’d like to share with you my recent experience on having a facial. I had been to different facial/skin care centers before and I was able to try their facial treatments a lot of times but I’d have to say this: Nothing compares to the facial I recently had with a Casmara facial treatment. Before I’d go into details, let me just clarify that I am not getting a single cent for writing about this on my blog. I decided to share it with everyone else so that you too could experience what I just had experienced. I won’t be surprised if one day Casmara will become a household word for everyone. Getting back to the said facial treatment, it was really amazing. Imagine spending an hour with a heavenly facial treatment? Casmara is a brand of natural facial masks. Before any treatment, a dermatologist would have to assess what type of facial treatment do you need. So the Casmara mask they’ll be using will be depending on your skin type. My friend had a collagen-infused mask because she needs anti-aging while another friend had a seaweed based mud mask because she had problems with her oily skin. I had herb and oatmeal mask because I had sensitive skin. I couldn’t help but compare this treatment with other facial treatments I had before. This time I was surprised that the therapist did not scrimp on the facial mask. After almost half an hour of thorough facial cleansing and massages, I felt the cold Casmara mask being spread on my face. It felt like my face was being coated with strawberry ice cream! The therapist politely asked if I wanted to have my face entirely covered, I said yes. Facial treatments had always been a nightmare for me, what with all the pricking of pimples + black and white heads extraction…But amazingly, not this one. If all facial treatments would be as relaxing as this one, I swear I must have gone to facial heaven—I could have slept, but I fought a good fight to keep my eyes from shutting out. Oh, have I also mentioned that this particular facial treatment includes a scalp massage too? Geez, I thought I had to pay for an extra service, you know. Well, it’s just right since this Casmara facial treatment is actually a bit expensive compared to regular facial treatments of other skin clinics. But I’d have to say, it really is value for your money because you’ll be leaving the clinic all-pampered that you’ll be coming back for more. Lastly, you could also bring home the Casmara mask, the friendly therapist would ask you if you’d like to take it home with you to use the other side of the mask. I said yes and she gladly gave it to me on a ziplock bag. She even gave some instructions that I should put it in a fridge and then use the other side (it’s easy to know which had been used because it’s glossy in texture) the very next day and pat it on my face for 15 minutes. Overall, I never thought facials could be this good. Facials need not be painful, you know? Getting a Casmara facial is one of the best things I had ever done for myself. It’s like giving my face its own a special massage while getting rid of all the dirt and grime on my face. After all, it is the face that people will get noticed first. Casmara facial treatments are available in Diana Stalder by Dermaline Skin Clinics nationwide. Like them on Facebook: www.facebook.com/casmara. Note: Please forgive me for the photos on my mobile phone had been corrupted that I can no longer include them on this blog post. So I decided to use a youtube video of Casmara masks instead. Disclaimer: I am not paid for this blog post. Opinions expressed are 100% my own. 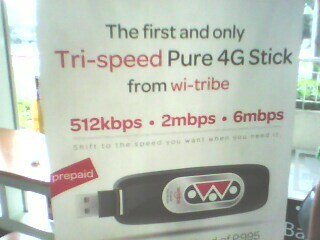 Wi-Tribe Telecoms Inc., the country's only pure 4G internet service provider has recently released their latest innovation--the Tri-Speed Pure 4G Internet Prepaid Stick that allows subscribers to surf at speeds of up to 6 Mbps or for as low as P25 unlimited surfing a day at 512 Kbps. The Tri-Speed Pure 4G prepaid stick is also affordable at P995 and exclusively available at 7-Eleven stores. 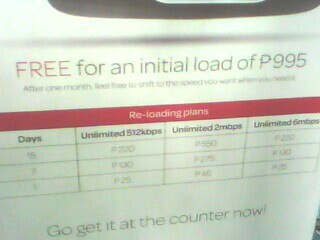 For P995, it already comes with a FREE 30 days unlimited surfing @ 2 Mbps. Wi-Tribe Telecoms Inc., a partnership between San Miguel Corporation and Qtel Group, has tied-up with 7-Eleven convenience stores because of its strategic store locations and has a wide coverage around the Metro. 7 Eleven, the largest convenience store chain in the country today with over 650 stores in the Philippines, caters to a wide market and offers a vast array of products. It was the first to introduce 24-hour convenience shopping in the country and it is just fitting for Wi-Tribe as it is the Philippines' first and only Tri-Speed Pure 4G Prepaid Internet stick available today. 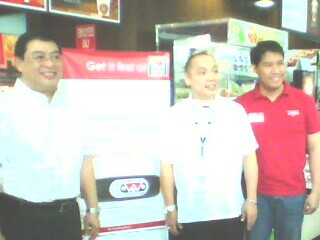 7 Eleven + Wi-Tribe executives partners to give consumers the BEST. Wi-Tribe is also the only Internet service provider that offers prepaid subscribers the option to pick the speed of their access according to their needs. And it's all because their Wi-Tribe 4G Prepaid stick is the only prepaid Internet stick dongle that has three different speeds. Yes, you could simply shift to the speed you like depending when you need it. There's 512 Kbps, 2 Mbps or 6 Mbps. It really is flexible and has the lowest denomination for a prepaid internet service at P25! That's half of the lowest denomination you can load a regular internet prepaid stick in the market today. It's easy to use because it is plug and play. Mr. Pike talks about Wi-Tribe Pure 4G Tri-Speed Stick. 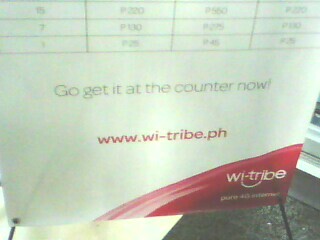 The Wi-Tribe Pure 4G Prepaid Internet Stick also comes in a really cute packaging--it comes in a reusable tumbler where you can sit back, relax and have a sip of juice or your favorite coffee while being online 24/7 checking your social media status or watching your favorite videos on youtube. Keep yourselves updated with what's happening around you with Wi-Tribe's Pure 4G Prepaid stick dongle. It may not be seamless, but it really is a good value for your money. Enough of the Internet cafe rentals where they charge you based on the time you've used up while online and stop worrying about hacking your account or emails by not being able to log out just because your time is up! It's about time you do your own thing at your own pace and time--make the switch now. With the Wi-Tribe Pure 4G Internet stick, say buh-bye to your old internet-related worries. This is the magical box! The Wi-Tribe box and package has an account number which you had to give to the 7 eleven for easy reload. 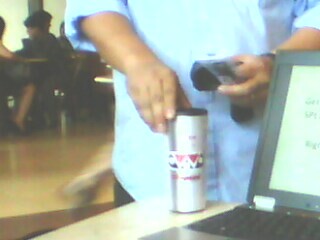 See this really cute tumbler? It is indeed a powerful stick. It comes with a USB cord. And it had a flip USB at the back. No longer had to look for its cover! 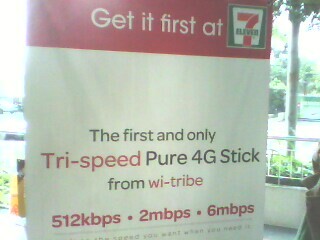 Get this Wi-Tribe Pure 4G Internet Prepaid stick baby and is now available at all 7 Eleven convenient stores around the Metro. This is initially available in Metro Manila 7 Eleven Stores and will soon be available in nearby provinces soon. Reloading is also available at 7 Eleven outlets. 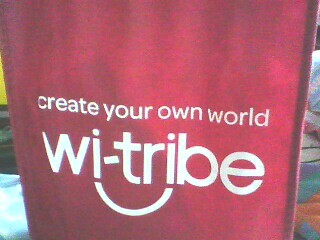 For more information about Wi-Tribe's 4G broadband plans, check out www.wi-tribe.ph or call 31-tribe today. November found my schedule spinning a bit out of control with the early Christmas shopping (not to mention haggling at the local bazaars), parties (yup, really…I even had to beg off sometimes because I’m not so much into it), cleaning chores, helping my sister with her ham business, wedding preparation (not mine, but that of my friends’), backlogs (blog posts that will be publish) and really to celebrate Yuletide. Long hours of standing at the MRT, heavy shopping bags and backpacks plus loads of meals from fast foods all resulted in less energy and a rather achy body. At some point, I felt on the verge of near collapse because of too much stress accompanied by late nights out and all I could think of was how to make up to my super stressed mind and body. I certainly do not want to abuse my health. I need to rejuvenate and relax even just for a while. A massage seemed to be on my plan so it was just serendipity that I received a message from Sarah Cabanlig to try Royal Oasis. Without further ado, I immediately said yes. The reception area with soft pillows to make you feel at home. I have nothing against home massages. I just feel going into a massage spa allows one to “disconnect” from the daily grind of your life. Getting to Royal Oasis is a bit tricky. But once you’re able to see their huge sign just across Elyong’s, it is synonymous to heaven. Located in Commonwealth Extension, Royal Oasis will definitely make you utter ooohs and ahhhs, as an expression of satisfaction. Royal Oasis is a haven for those tired bodies that needs pampering. Specializing in Thai and Swedish massage, Royal Oasis upholds these ancient and traditional methods to de-stress the mind and body, giving one a heightened sense of peace and well being. They even have a shower for your needs. The comfort room at Royal Oasis. Upon entering Royal Oasis, I felt instantly at home. 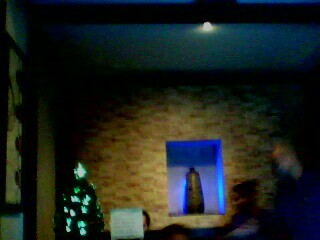 The ambiance was cozy and the staff gave such a warm welcome. The treatment of choice, Royal Tranquility Swedish body massage. It was really invigorating—perfect for me since it was still mid-day and I still had evening obligations to attend to. 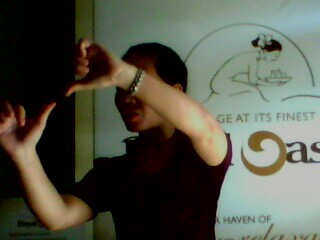 My one-hour escape had a massage with lavender oil. Upon my arrival, I was treated like royalty with a cup of their signature hot ginger tea. I was surprised for I never liked “salabat” or anything with ginger but this time I really enjoyed its sweet and mildly tangy taste. The treatment started with the relaxing foot soak before the actual massage. Comforting Ginger Tea--one sip and you'll be hooked! When the treatment started, I silently hoped that time would stop and let me enjoy this serenity for as long as possible. The massage was done in a strong circulatory manner that initially kneaded out the tightened muscles or those lactic acids (better known in vernacular as “lamig”) especially on my overworked calves and lower back. 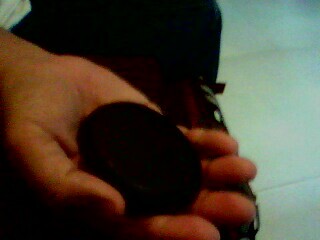 Warm oil was further rubbed into my skin to help aid in blood circulation. My shoulders and neck were also treated with massages and hot pads. I could feel the familiar “pop” of muscles loosening and even if I didn’t fall asleep I knew my body was getting the recharge it needed and deserved because of the intensity of the massage. The staff explains how they do swedish massage. The relaxing foot soak before the treatment. When I was done, I couldn’t help but feel a different kind of zest within me! I got the boost I needed and the relaxing pampering I so desired. Whether it is to soothe and sleep, getting a massage is a definite way of saying “love yourself”—and I highly recommend that you get it from Royal Oasis. Other services include the Aromatherapy Massage and Volcanic Stone Massage, which are definitely a standout. The courteous and well-trained staff will also ensure that more than the therapy; they give you the best service possible—what with their royalty treatments. Your Royal Oasis experience will keep you coming back for more. Come and visit them at Unit 1-D GV Square, North Commonwealth, Fairview, Quezon City (beside Kowloon, in front of Elyong’s). Royal Oasis is open Mondays to Sundays, from 2:00PM to 2:00AM. Please contact 904-3099 or 0917-9426176 for reservations. Like Royal Oasis on Facebook as well. Here's a tip: Of course, we all want value for our money right? 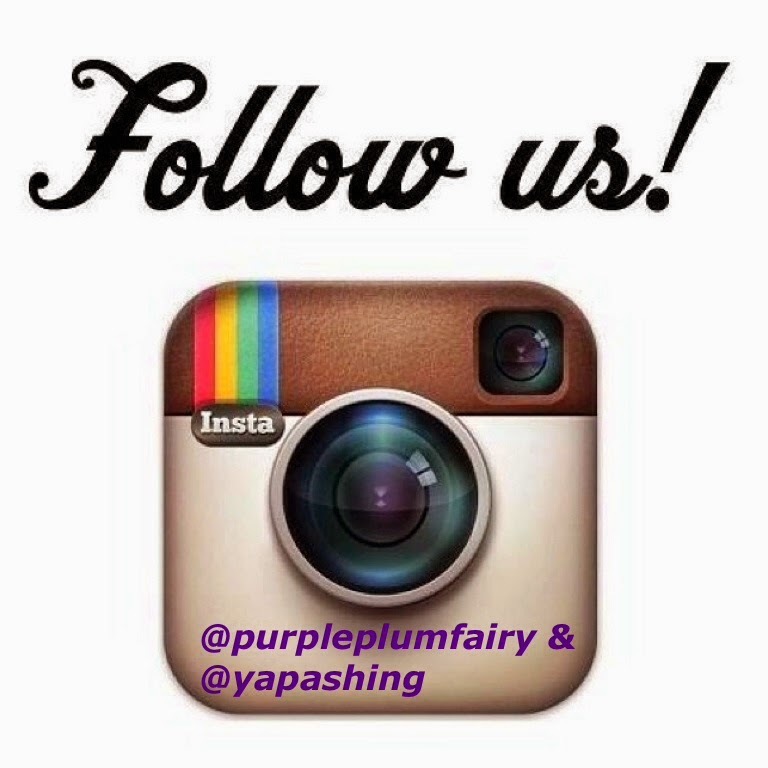 Then do visit them from Mondays to Thursdays 2PM to 5PM, they give a 30-minute extension on all services. You could also try their volcanic stone massage for only P600 and they have a special treat on your birthday too: Get 25% off on all services within 7 days before or after your birthday. All these and many more will surely make dropping by the Royal Oasis a part of your daily schedule. 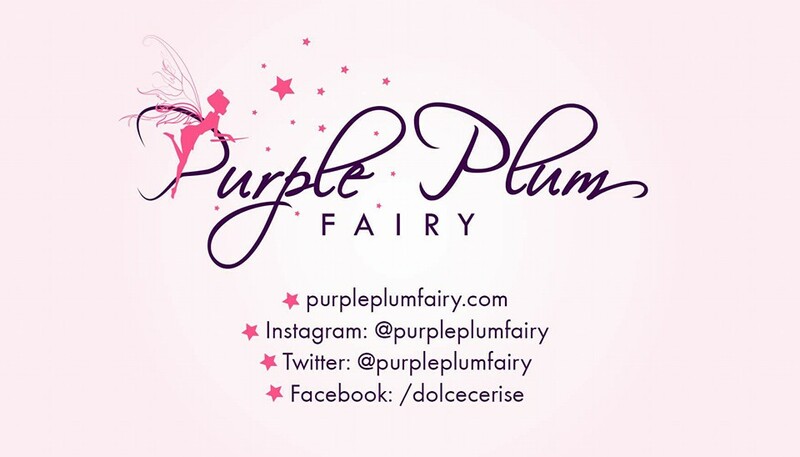 The Purple Fairy thanks Ms. Sarah Cabanlig, Ms. Lenylyn Abutar, and Mr. Verchie Totanes of Royal Oasis Massage. 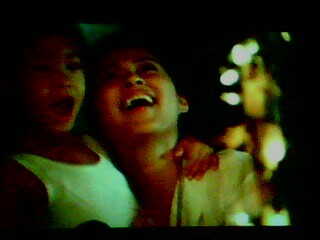 2005 Miss International turned actress Precious Lara Quigaman as Miriam with the young JP. Christmas is all about hope and sharing. It is the season of joy and of course, for most hard-working office employees, the month of December is also the time when the much awaited 13th month pay or bonus will be given. You must have received your so-called Christmas bonus pay by the time you read this. But have you ever thought of sharing to the unfortunate ones? Sharing isn’t beyond one’s means. One doesn’t need to be rich in order to share. You could share your time and talent and make a big difference. 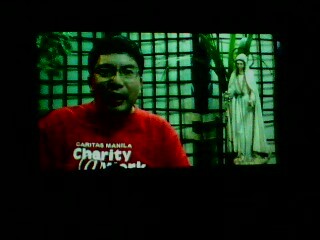 An old friend of mine invited me for the Caritas Manila advocacy film showing at San Carlos Seminary Auditorium last week. 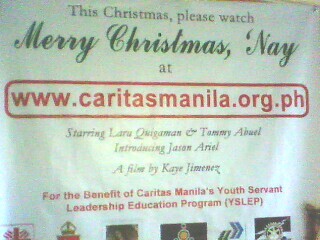 The 32-minute short film titled Merry Christmas ‘Nay was written and directed by Kaye Jimenez and produced by Caritas Manila and Morning Star Productions. It clearly sends the message of Caritas’ advocacy for education but more than that it delivers the message that the reason for the season is God. We all love Christmas, don't we? 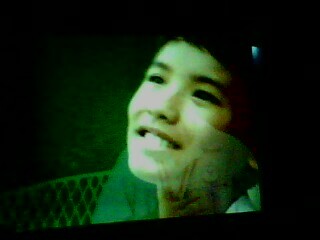 “Paborito ko talaga ang Pasko, tuwing Pasko Masaya,” says 12-year-old John Paul or JP, played by a newcomer named Jason Ariel, at the opening of the film. The first line of the short film is in contrast against JP’s physical stance—dirty and hungry. But the movie in its entirety presents itself through a simple narrative with an impact among its audience—touching their hearts. Merry Christmas ‘Nay tells the poignant story that involves Miriam, Father Joseph and JP. Miriam (played by 2005 Miss International turned actress, Precious Lara Quigaman) is a stay-in janitress at the Holy Infant Academy. Nothing much is said about her except that she’s dedicated to her job and that she’s deaf and mute. Father Joseph, whose character is brilliantly portrayed by theater veteran Tommy Abuel, is the in-house priest of the parochial school who also teaches values education to the pupils. Just like Miriam, he lives in the school compound. JP is the child Miriam had adopted after his own parents left him as a newborn baby in a manger with the life-size figures of Mary, Joseph and baby Jesus. He was christened as John Paul because of Miriam’s devotion to Pope John Paul II, whose picture she always carries in her purse. Theater veteran Tommy Abuel as Father Joseph. Newbie Jason Ariel as JP. Every year, Miriam excitedly brings out all the characters of the nativity from the storeroom of the church. With love in her heart and great respect, she decorates the manger. And since JP came into her life, she had also passed on the said tradition to him. I won’t be saying much of the spoiler here so I would strongly suggest that you see the film yourself. Everything ran smoothly until a family tragedy happened that had left JP (now a grade 6 scholar) depressed. He finds temporary solace in the company of other street children. Destiny has its way to find those who seemed to have lost their way; JP returned to the classroom to see his teacher, Father Joseph it is a scene that will surely remind one of The Prodigal Son. Merry Christmas ‘Nay—the first film project of Caritas Manila and also its first Internet-Based advocacy drives home the point that education is important to help one to achieve one’s dreams. The need to educate oneself is the strong foundation in building a better future. If you think this movie is preachy, think again. It presents opportunities for people if we are kind enough to share our blessings. 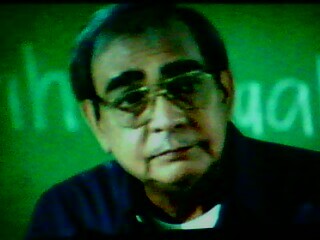 Father Joseph repeatedly said in the film this quote: “Kapag may nagsarang pinto, may bintanang mabubuksan,” It is the guiding principle that the movie is saying. It is the moral that brings JP back into the right tracks and finding his own strengths. Kaye, also the executive producer of Merry Christmas ‘Nay through the kindhearted people, sends 3,000 scholars to college and vocational schools. Caritas Manila has a program called Youth Servant Leadership and Education Program (YSLEP) –and they are aiming to send 10,000 poor but deserving students back to school in the year 2012. YSLEP isn’t just a simple scholarship program. YSLEP is Caritas Manila’s integrated youth development program that develops the youth’s potential in terms of knowledge, skills, and attitude to train them to become leaders. YSLEP utilizes trainings and formations that emphasize academic excellence and leadership while cultivating moral integrity and social commitment to the poor. Helping and sharing isn’t beyond our means. You can help Caritas Manila to shape more leaders and uplift more scholars! Give them a call +632 5639309 or donate through their website www.caritasmanila.org.ph, email them at cm@caritasmanila.org.ph or drop by at their office Caritas Manila 2002 Jesus St. Pandacan, Manila, Philippines. 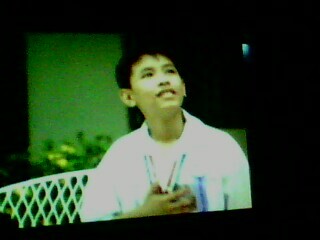 This holiday, log on to www.caritasmanila.org.ph and watch this heart-warming film with your family. 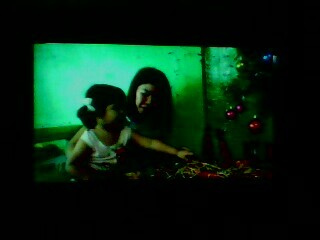 Merry Christmas ‘Nay will surely touch your hearts the same way it had touched mine. I was recently invited to cover the awarding ceremony for Ascof’s Natural Super Mom’s Search for Mother of the Year held at the posh restaurant Felix in Greenbelt 5. It was the apex to a long tribute (it was a 7-month celebration of motherhood) to mothers that began on Mother’s Day at SM North Edsa and made its way towards other selected SM malls nationwide. 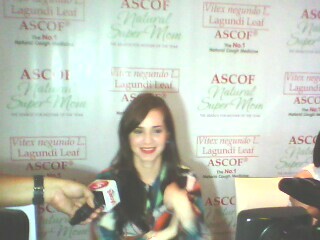 Among its panel of judges was none other than Ascof Brand Ambassador and Congresswoman Lucy Torres-Gomez. 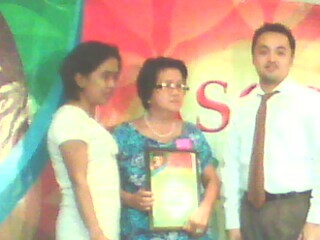 The grand winner Mrs. Esperanza Yu from SM Southmall was the most exemplary among the amazing group of women. 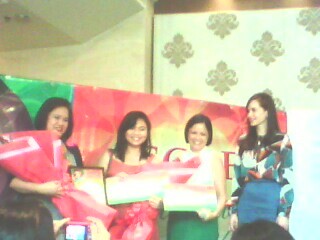 She was awarded with Php50, 000 plus a number of valuable gifts. 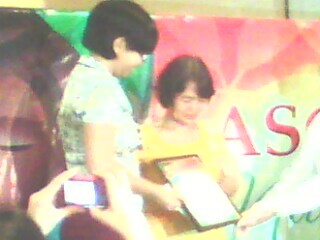 A prize of Php 7,000 was also awarded to her daughter who nominated her. Ascof's Mother of the Year Mrs. Esperanza Yu and daughter with Ms. Mia Pascual-Cenzon, Pascual Lab Director for Corporate Communications and Ascof Ambassador and endorser Congresswoman Lucy Torres Gomez. It was one of the most touching events or awarding coverage I’ve ever been to. Media guests like us couldn’t help but be moved by these amazing mothers. They all deserve this tribute. The grand winner, Mrs. Yu even shared her award to those mothers who were not able to join and be nominated in this contest. 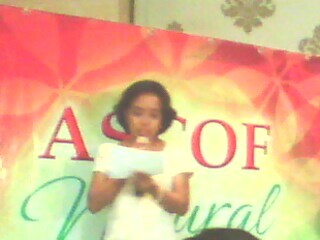 Mommy Gigi sheds tears as she reads excerpts from her writeup about her mommy dearest. My fellow blogger, Mommy Gigi Beleno who nominated her mother Mrs. Belen Celemin were also one of the finalists among a hundred participants. Finalists were awarded with Php 20,000 while Php 3,000 were given to those who nominated them. They were asked to read excerpts from their entries before each nominee was introduced and that has left almost everyone from the crowd with tears in our eyes. Blogger Mom Gigi Beleno with Mommy Belen Celemin. Mary Ann made her Mom really happy that Mrs. Coronado shed tears of joy. I got the chance to interview one of the finalists, Mrs. Hermini B. Coronado who was nominated by her daughter Mary Ann Coronado-Abines. They also had a really touching story to share with Mary Ann's mom suffering from stroke, mother and daughter surely had tough times. In fact, when I asked them what they'll be doing with the money they'll be getting from the said contest, they said they'll use it to support Mrs. Coronado's therapy. 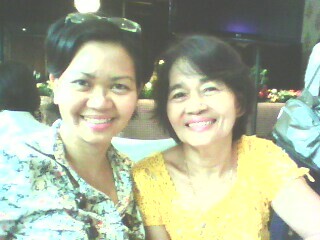 Mary Ann Coronado-Abines and Mommy Hermini Coronado smile before my camera. Lucy is a natural super mom herself, juggling her roles as a public servant, television personality, and of course, mother to Juliana. During the said event, Lucy understands that it entails a lot of hard work in order to raise kids. Mothers are selfless ones who light the homes, give unconditional love, care and support, nurturer and do everything to make sure her children are all right. For Ascof, its Natural Super Mom search was a tribute to mothers everywhere. It is a salute to their selfless loving, an honor for those who, outside of their homes are also career women, mompreneurs, philanthropists, socio-civic leaders and health advocates. Ascof Natural Super Mom-Mother of the Year Search was organized by Crush Communications Philippines in cooperation with the following sponsors: ASCOF LAGUNDI-the Natural Cough Medicine, Pascual Consumer Healthcare Corporation, SM Supermalls, PLDT, American Standard, Gain School Advance, St. Luke’s Medical Center, The Philippine Star, PAC (Professional Artist Cosmetics), Ystilo Salon and Nail-a-Holics. Special thanks to Media Sponsors: Melo 94.7 and Crossover 105.1 and Fox International Channels. With that, Kudos to Ascof and to all Mommies out there! 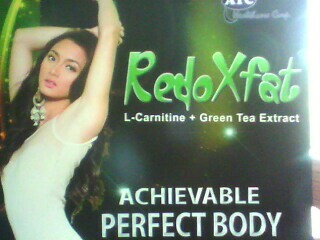 Ms. Iya Villania as RedoxFat endorser. Iya Villania wears a couple of hats ever since she has entered show business. She’s a VJ, TV Host, actress, total performer and product endorser among many others. Iya also possesses one of the prettiest faces in the Philippine showbiz industry today. She’s also made it a couple of times to the A-list sexiest celebrities of FHM Magazine Philippine edition. Indeed, Iya Villania definitely has beauty, brains and body to begin with. ATC Healthcare had also noticed these good qualities in Iya. They had recently signed her as its official endorser for Redoxfat, a dietary supplement. “ATC chose Iya Villania as RedoxFat’s endorser because she embodies the lifestyle of our target consumers. Despite her very demanding schedule, she still manages to stay in tip-top shape and keep her good reputation,” ATC Healthcare Marketing Manager Kathleen De los Santos shares. During the contract signing and product launching held at the Wheatberry Bakery and Café in Quezon City, invited health experts like fitness guru + personal trainer + Club 360 owner Chappy Callanta and wellness advocate Dr. Marthony Basco gave talks on weight and stress management as well as practical tips on how to lead a healthier and stress-free lifestyle without necessarily emptying one’s pocket. Redoxfat helps to jumpstart and eventually achieve personal health goals and programs composed of exercise, right food choices, and a positive mindset. Dr. Basco, a Public Health expert, further explained how the weight loss can help reduce the risk of heart and kidney diseases, diabetes, infertility and fatigue. Chappy Callanta shares his thoughts on how to lead a healthier life. 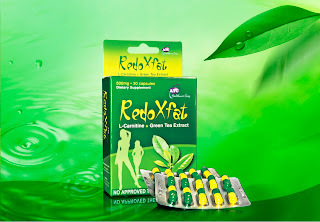 ATC Healthcare’s own brand of diet supplement Redoxfat Slimming Capsules has L-Carnitine and Green Tea. What is L-Carnitine? It is a product of Lysine and Methionine (Niacin, B6, Vitamin C and Iron). L-Carnitine is the only known substance that allows fatty acids to cross the mitochondrial membrane. In layman’s term, L-Carnitine helps a lot in making our metabolism to go faster. Fat + L-Carnitine + Oxygen = Energy. 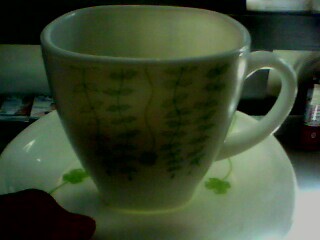 How about Green Tea? 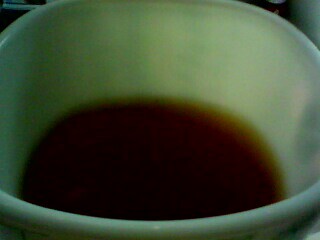 Green Tea is a very good antioxidant. It has catechins that facilitates weight loss, lowers cholesterol and prevents the growth of cancer cells. ATC Healthcare’s own brand of diet aid RedoxFat Slimming Capsules has seven times more L-Carnitine than other leading brands- an amino acid known for fat breakdown and muscle development. The capsule is made even more powerful with Green Tea extract to assist weight loss, lower cholesterol levels, and release energy channels. “Our dietary supplements are all 100% natural and passed the Bureau of Food and Drugs (BFAD) quality control standards,” adds De los Santos. 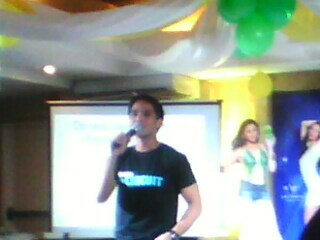 Quad Media asks Iya questions during the presscon. Known as a trusted provider of food supplements, ATC Healthcare continuously provides quality yet affordable products to promote optimum health and wellbeing. “We train our people to become the best service provider, guided by the highest ethical standards to produce the most innovative healthcare products in the market today,” De los Santos enthuses. In addition to RedoxFat Slimming Capsules, ATC has a comprehensive line of healthcare supplements in soft gel form: Aloe Vera, Calcium with Vitamin D, Coenzyme Q10, Fish oil, Evening Primrose, Garlic Oil, Ginkgo Biloba, Ginseng, Grape Seed, Lecithin, LiverMarin, Lycopene, Glutathione, Royal Jelly, and Spirulina. All of these can supplement one’s health needs if taken regularly. 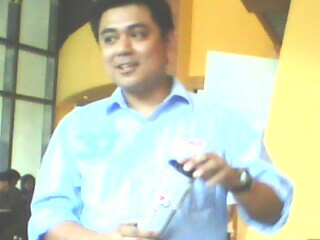 “I feel happy and blessed that ATC had entrusted me to endorse their Redoxfat. I’ve experienced a new zest of energy when I started using it, which helped me a lot in my dance performances and hosting stints. Not to mention, it made me sexier and healthier. I’ve lost a couple of pounds since I started using it. I truly believe in this product because I had seen and proven how effective it is,” shares Villania. Abs-Cbn's Mario Dumawal interviews Iya Villania before the launch. Iya gamely answers all the questions of the press. One blister pack of RedoxFat has 30 capsules and should be taken as a dietary supplement. One can take 2 to 3 capsules a day, after meals. For more information about ATC Healthcare products, call 749-4542 or 743-5183, or visit www.atchealthcare.com. You can also email inquiries, suggestions, and concerns to atchealthcare@yahoo.com.ph. 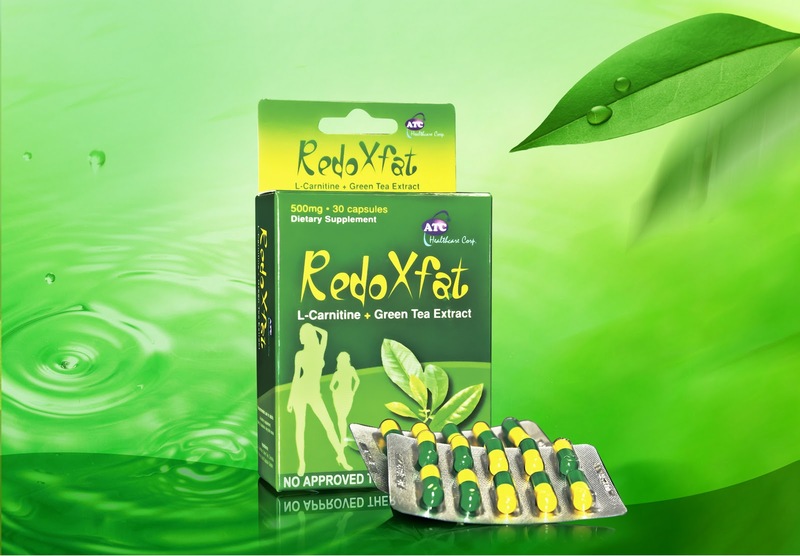 RedoxFat Slimming Capsules is available in leading pharmacies and wellness centers nationwide.